Since having my hair cut into a long bob last year, i have given my haircare routine a shake up - not only because i had about 4 inches taken off but because my hair has become quite dry and damaged. I wanted to show you all the products and tools i use to cleanse / protect / style my hair. 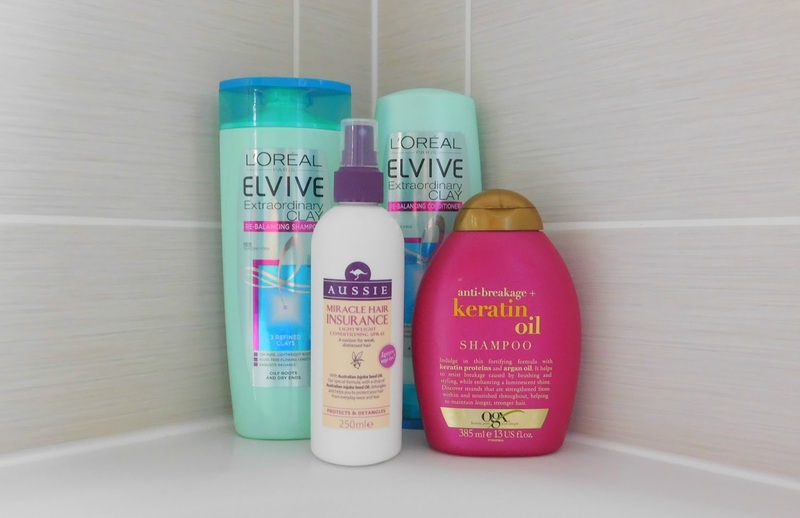 This combination of products gives me manageable locks, that are soft and hydrated. Plus through beauty boxes i have discovered lots of new products over the last 6 months and have adopted a couple into my routine, alongside some of my faithful favourites that i have used for years. First up i wash my hair with the new L'Oreal Elvive Extraordinary Clay re-balancing shampoo (which helps with both oily roots and dry ends, perfect for my hair), then coat my hair in the matching conditioner and leave in for around five minutes while i wash/shave my legs/tan etc. Then once washed out i will also add a spritz of the Aussie Miracle Hair Insurance leave in conditioner onto the ends of my hair for some added protection. Twice a month i will switch it up and use my OGX Anti-breakage Keratin Oil shampoo instead of the L'Oreal Elvive duo to give an extra boost with the keratin and argan oils. I also find switching it up helps to keep my hair soft and glossy. 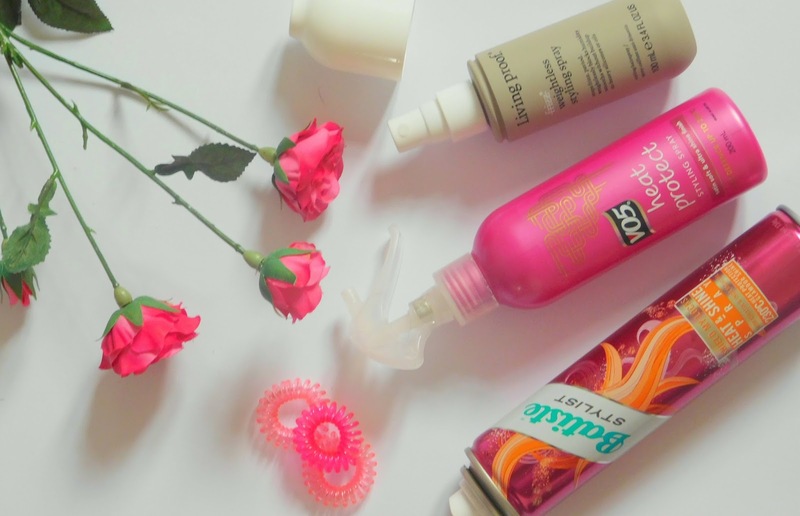 I am going to admit that when i was younger, protecting my hair was something i never thought about but now it is an important step in my routine. First i will start with a new product, coating my hair in Living Proof's Frizz Weightless Styling Spray which helps to eliminate frizz, smooth hair and repel dirt. I normally leave my hair to air dry for half an hour before adding heat, so will spray on VO5 Heat Protect Styling Spray and comb through. Then once my hair is dry, i will always use the Batiste Stylist Heat & Shine Spray - i do this before i straighten or curl my hair. All three products help to protect from heat damage and create shiny smooth hair. A few basic tools in my routine... a Birchbox "tangle teaser" style brush, a large paddle brush, actually from Primark, gives me a smooth blowout. A basic drugstore, wide tooth comb perfect for combing through wet hair without causing breakage. Remington Hairdryer, not sure what model as it is about 8 years old, but i always buy my hairdryers from Remington as they work well and last for years. Finally the one item in my entire routine that i couldn't live without! my GHD classic straighteners. Naturally i have thick, curly and coarse hair that without heat intervention leaves me looking like i have a lions mane....so thank god for GHD's. 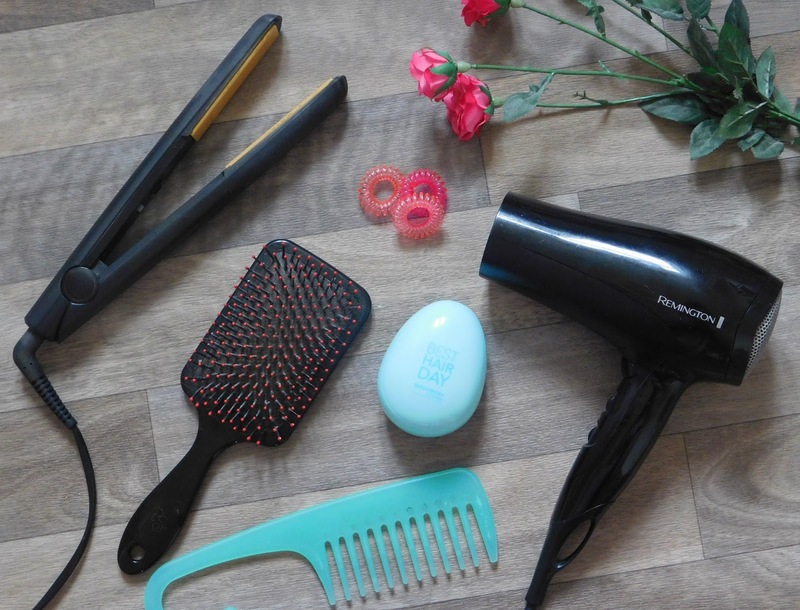 I tried many brands of straighteners when i was younger, mainly because of the price of GHD's however none compare to the effortless, smooth styling achieved - would never go back to cheap alternatives. I am considering also investing in a GHD curling wand, especially if they are as good as the straighteners. I try and keep the finishing products i use to a minimum, so i have narrowed it down to just three. First up dry shampoo, which i will use straight after washing my hair to add a little grit to a fresh blow dry and then on days in between washing to freshen up and add volume back into my hair. 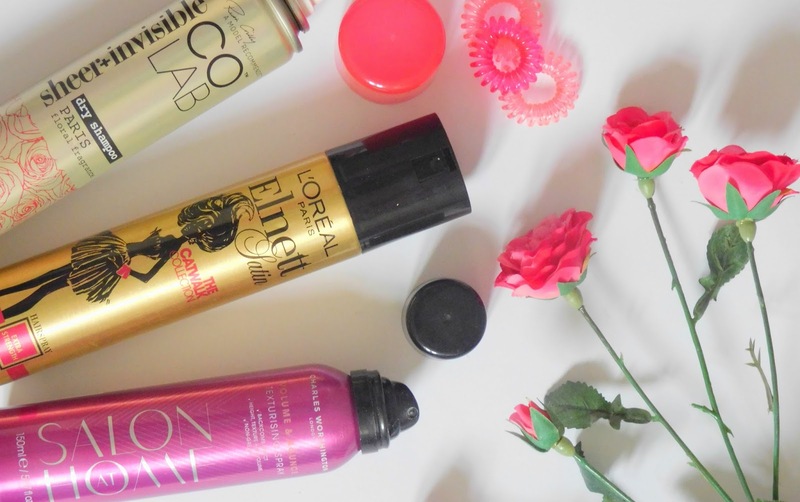 I used to be an advocate of the Batiste dry shampoo however i discovered Co-lab Dry Shampoo from Superdrug and much prefer the smell, texture and consistency - I always go for the Paris floral fragrance as i find it light and fresh. Next up once i have curled my hair, which i tend to do everyday now i will add some extra texture, to give an almost beach waves feel and the best spray i have found so far is the Charles Worthington Volume & Bounce Texturising spray. Lighter than a salt spray but offers both texture and light hold, perfect for loose curls. Finally a product i only tend to use with a updo is my L'Oreal Elnett Stain Hairspray, offers great hold but brushes out easily. 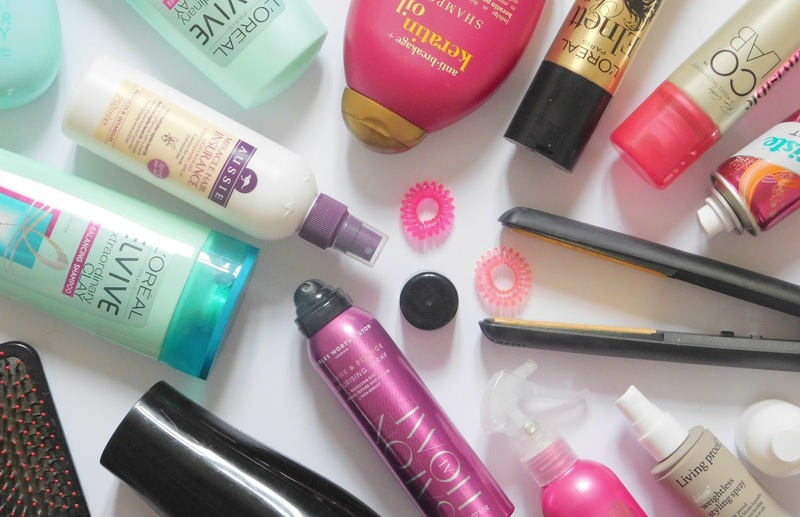 What products are in your haircare routine? Do you keep it simple or do you love to mix it up and use lots of different products?